ORLANDO, Fla. (November 14, 2017) – Today, SeaWorld Orlando revealed the first of 15 custom rafts for its new Infinity Falls river rapids attraction opening summer 2018. The 8-passenger raft features custom theming and décor resembling supplies found on real white-water rafting expeditions. 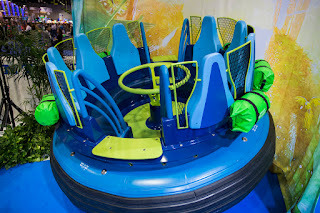 The circular raft design puts riders face-to-face and allows friends and family to enjoy this exhilarating attraction together.